Use these eBooks.com coupon codes to save on e-book downloads for your PC (or Mac), Sony Reader, Kindle, mobile phone and more! The following e-book coupon codes can be used upon check out at the eBooks.com Payment Details page. Please note that some authors do not allow discounts to be applied on their books. Chanukah Promotion at eBooks.com Enjoy 15% off Body, Mind & Spirits titles. Use eBooks code: litefestivalcp. Until Dec 15, 2010 only! 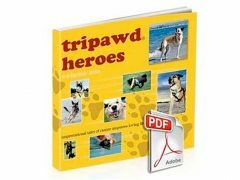 See the entire selection of Pet Bookss at eBooks.com! 3 for $9.99 on Michael Connelly’s The Harry Bosch Novels Volume 2 at eBooks.com! 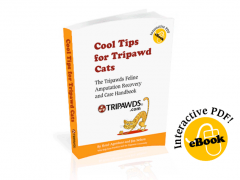 And Remember… for the best recovery advice and fast answers to the most common dog amputation questions download the new Tripawds e-book, Three Legs and a Spare! To send this e-book to a friend, just give us their email address in the comments field when placing your order and you will both receive a copy!